The Stratospheric Observatory for Infrared Astronomy (SOFIA) is a highly modified Boeing 747-SP with a 2.7m Cassegrain telescope housed in a large cavity in the rear part of the fuselage. SOFIA was designed to observe the universe in the infrared spectrum from the lower stratosphere at altitudes above 41kft. For science operations, a large door that is integrated in the fuselage will be opened to clear the telescope ́s view to the sky. The open cavity is then exposed to the airflow surrounding an aircraft flying at a Mach number of 0.85. The highly unsteady shear layer evolving over the open cavity port is responsible for prominent pressure fluctuations in the cavity and on the telescope surface that lead to structural vibrations, which in turn, deteriorate the pointing stability of the telescope. In addition, the telescope has to look through the highly turbulent shear layer which imposes aero-optical aberrations to the passing wavefront. 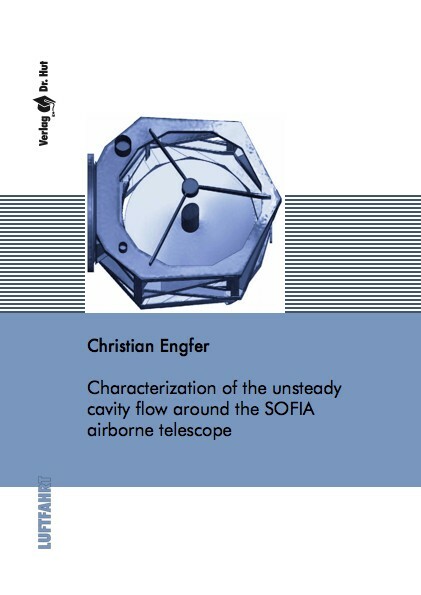 The objective of this thesis is to characterize the SOFIA cavity flow from an aeroacoustical and an aero-optical perspective by means of flight test data, as well as an evaluation of the existing Computational Fluid Dynamics (CFD) model and the investigation of further passive flow control concepts.